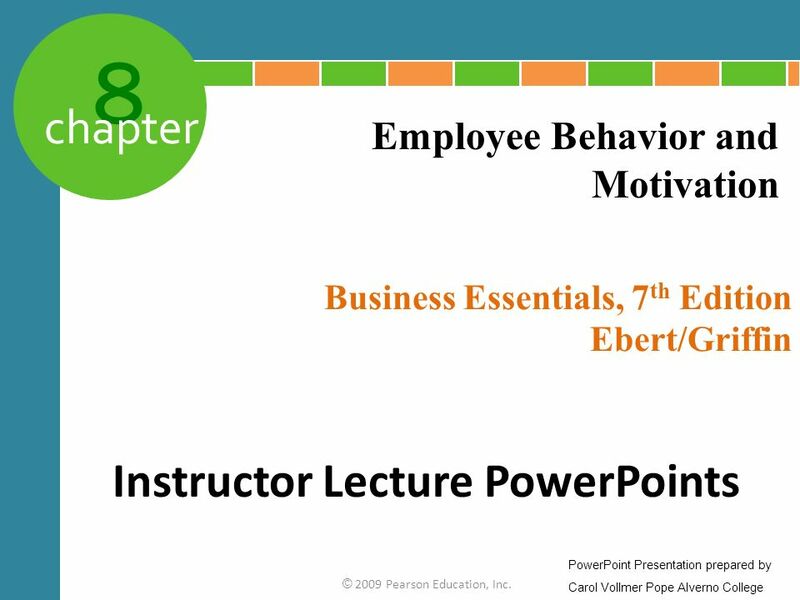 Employee Behavior and Motivation Business Essentials, 7th Edition Ebert/Griffin Instructor Lecture PowerPoints PowerPoint Presentation prepared by Carol Vollmer Pope Alverno College © 2009 Pearson Education, Inc.
2 © 2009 Pearson Education, Inc.
3 L E A R N I N G O B J E C T I V E S After reading this chapter, you should be able to: Identify and discuss the basic forms of behaviors that employees exhibit in organizations. 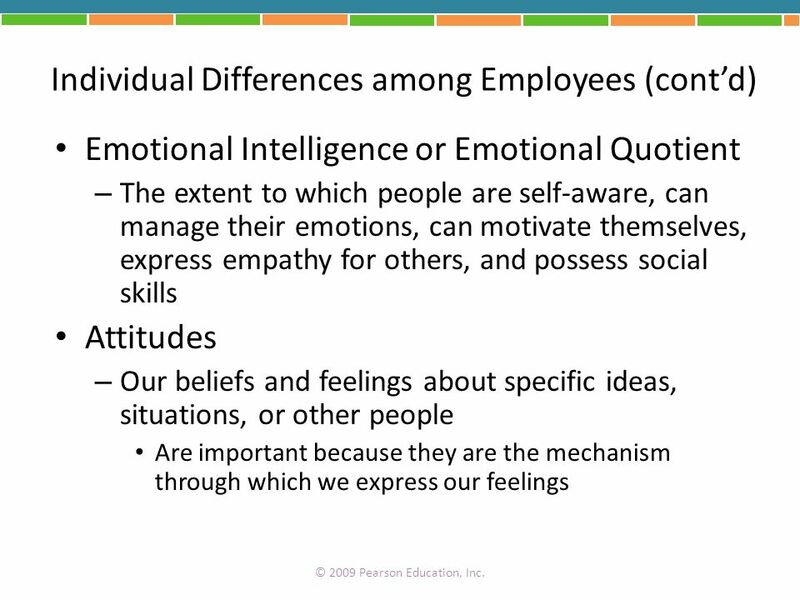 Describe the nature and importance of individual differences among employees. Explain the meaning and importance of psychological contracts and the person-job fit in the workplace. Identify and summarize the most important models and concepts of employee motivation. Describe some of the strategies and techniques used by organizations to improve employee motivation. © 2009 Pearson Education, Inc. In this chapter we will examine the topic of employee behavior and motivation. We will identify and discuss the basic forms of behaviors that employees exhibit in organizations, and we will describe the nature and importance of individual differences among employees. Then we will explain the meaning and importance of psychological contracts and the person-job fit in the workplace. And finally we will identify and summarize the most important models and concepts of employee motivation and describe some of the strategies and techniques used by organizations to improve employee motivation. Teaching Tips: Ask the class to form student teams of two. In your teams, please choose one of the five learning objectives we have just reviewed. Please discuss your basic understanding of your learning objective. We will share these with the class. Answers will vary based on learning objectives. You can hold off further discussion of the objectives until later in the class. 4 © 2009 Pearson Education, Inc.
What’s in It for Me? By understanding the basic elements of this chapter, you’ll be better able to: Understand your own feelings toward your work from the perspective of an employee Understand the feelings of others toward their work from the perspective of a boss or owner What’s in it for me you might ask? By understanding the basic elements of this chapter, you’ll be better able to: Understand your own feelings toward your work from the perspective of an employee. Understand the feelings of others toward their work from the perspective of a boss or owner. Teaching Tips: In your student teams, discuss two basic elements we have just reviewed. Each student team member will interview his or her teammate and ask them what their current attitude toward their work is as an employee. Then the team members will switch roles, taking on the role of the boss or owner of a company. Please interview each other about your perceptions of the feelings of work from the perspective of a boss or owner. We will share highlights of our interviews with the class. Answers will vary. Allow the sharing of interview results and feelings, but consider saving review of them until later in the chapter. © 2009 Pearson Education, Inc. The pattern of actions by the members of an organization that directly or indirectly influences the organization's effectiveness Employee behavior is the pattern of actions taken by the members of an organization that directly or indirectly influences the organization’s effectiveness. For example, listening to employees in a monthly roundtable “bring your own lunch” hour in a small business can open a platform for a discussion of employee behavior. Teaching Tips: In your student teams, please make a list of five actions of employees or management that could impact an organization’s effectiveness. Answers will vary but could include coming late to work, spreading rumors, sharing openly about issues that arise. © 2009 Pearson Education, Inc. Performance Behaviors The total set of work-related behaviors that the organization expects employees to display Organizational Citizenship The behavior of individuals who make a positive overall contribution to the organization Counterproductive Behaviors Behaviors that detract from, rather than contribute to, organizational performance Some other forms of employee behavior include: Performance behaviors: These behaviors are the total set of work-related behaviors that the organization expects employees to display. Organizational citizenship: This is the behavior of individuals who make a positive overall contribution to the organization. Counterproductive behaviors: These are behaviors that detract from, rather than contribute to, organizational performance. 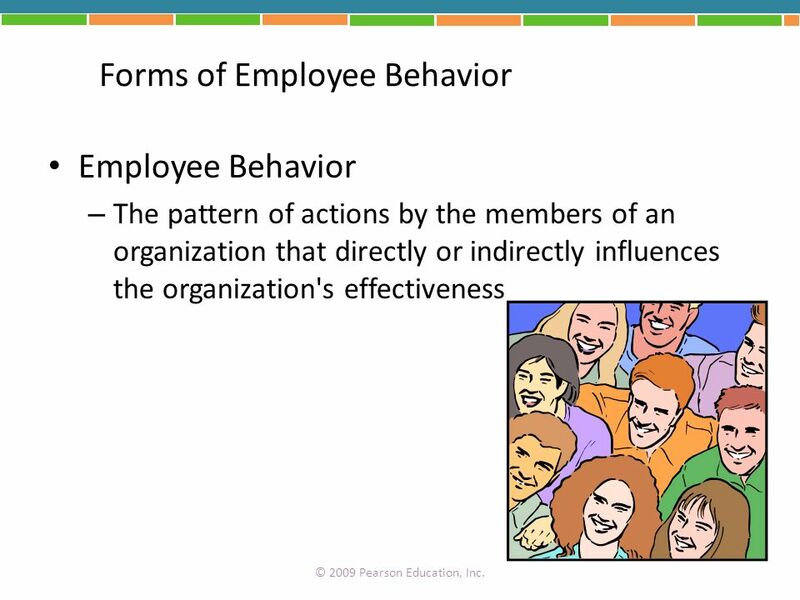 Teaching Tips: In your student teams, please review the five examples of employee behavior that you made a few moments ago. 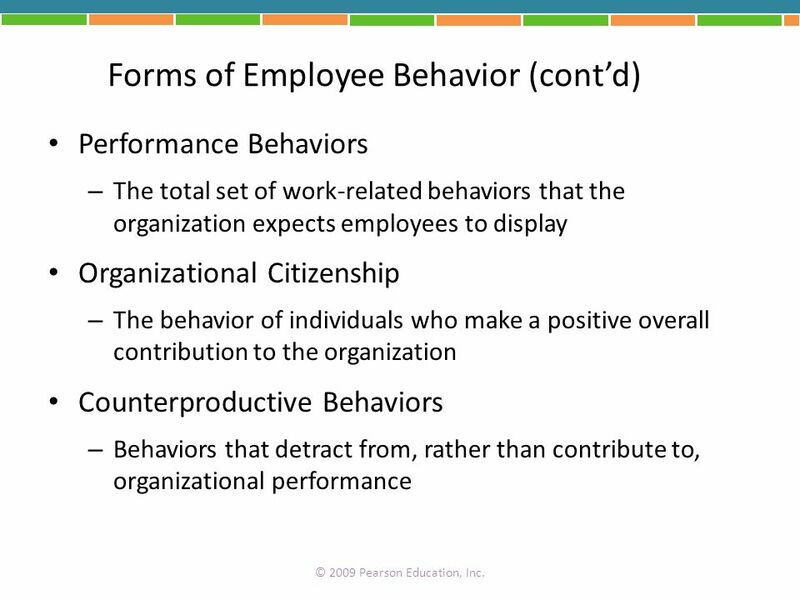 Now please categorize the behaviors you listed into one of the three forms of employee behavior we have just discussed. Be sure to note why each behavior fits the category you choose. We will share our answers with the class. Answers will vary based on behavior identified by each team; however, the answers should be reviewed through the lens of the three types of behaviors just reviewed in this slide. © 2009 Pearson Education, Inc. 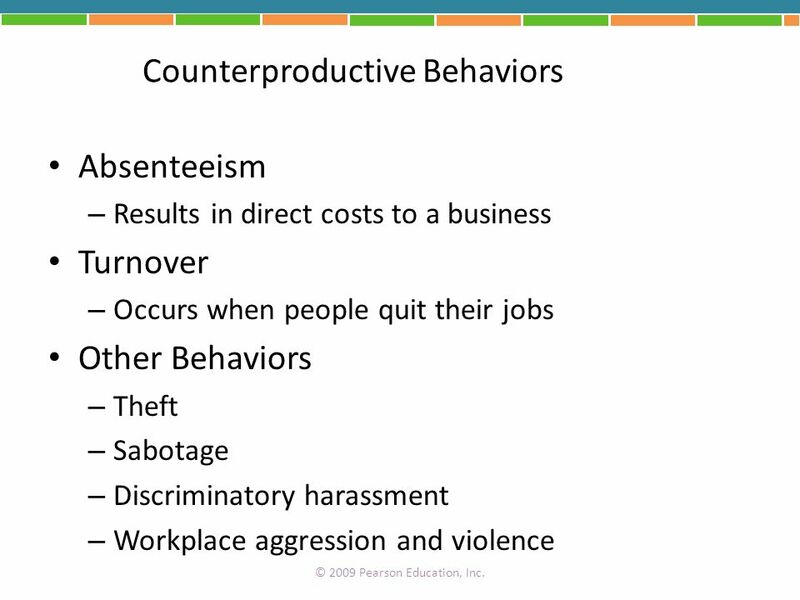 Absenteeism Results in direct costs to a business Turnover Occurs when people quit their jobs Other Behaviors Theft Sabotage Discriminatory harassment Workplace aggression and violence Let’s look further into counterproductive employee behaviors. Some of these, as we have identified in our groups, include: Absenteeism, which results in direct costs to a business. Turnover, which occurs when people quit their jobs. A manager should always do an exit interview with an employee to determine why that person is leaving the organization. Other behaviors such as theft, sabotage, discriminatory harassment and workplace aggression and violence. Teaching Tips: In your same student teams, please choose one of the counterproductive behaviors we have just discussed. Please discuss why an employee might exhibit these type of behaviors. Answers will vary. You can save review until later in the chapter as we explore reasons. © 2009 Pearson Education, Inc. Personal attributes that vary from one person to another—physical, psychological, and emotional Personality at Work Personality—the relatively stable set of psychological attributes that distinguish one person from another We need to consider individual differences among employees as a manager. 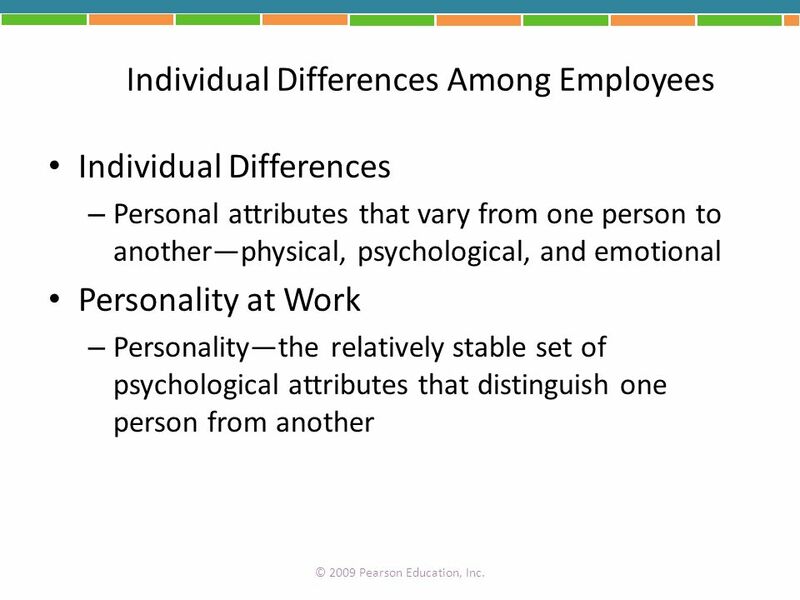 Let’s look at two of these: Individual Differences: These are personal attributes that vary from one person to another. They include: Physical differences. Psychological differences. Emotional differences. Personality at Work: Personality is the relatively stable set of psychological attributes that distinguish one person from another. Teaching Tips: In our student teams, let’s develop a list of personality attributes that an employee might bring to the workplace. We will share our answers with the class. Answers could include: Stability, confidence, thoughtfulness, imagination, disruptiveness, rebelliousness, ambition, laziness, etc. © 2009 Pearson Education, Inc. The “Big Five” Personality Traits Agreeableness Conscientiousness Emotionality Extraversion Openness OK, now let’s compare our lists to those personality traits considered to be the “Big Five”. 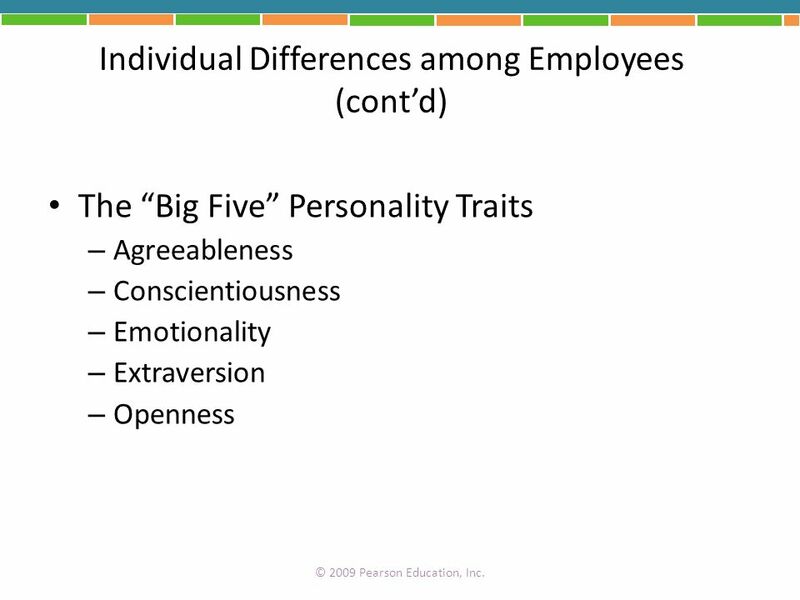 The “Big Five” Personality Traits include: Agreeableness. Conscientiousness. Emotionality. Extraversion. Openness. Teaching Tips: Now let’s discuss in our teams and with the class why these five might be considered the “Big Five.” How many of your teams chose these? Answers can be found on p. 109 of the text. © 2009 Pearson Education, Inc. Emotional Intelligence or Emotional Quotient The extent to which people are self-aware, can manage their emotions, can motivate themselves, express empathy for others, and possess social skills Attitudes Our beliefs and feelings about specific ideas, situations, or other people Are important because they are the mechanism through which we express our feelings Emotional Intelligence, or Emotional Quotient, refers to the extent to which people: Are Self-aware. Can manage their emotions. Can motivate themselves. Can express empathy for others. Possess social skills. In addition, our attitudes, which are our beliefs and feelings about specific ideas, situations, or other people, are important because they are the mechanism through which we express our feelings. Teaching Tips: In your teams, please choose one element of emotional intelligence and discuss how your own ability to apply that skill could help you in the workplace. We will share our answers with the class. Answers will vary. © 2009 Pearson Education, Inc.
11 © 2009 Pearson Education, Inc.
Attitudes at Work Job Satisfaction (Morale) The extent to which people have positive attitudes toward their jobs Organizational Commitment An individual’s identification with the organization and its mission Promoting Satisfaction and Commitment Treat employees fairly Provide rewards and job security Allow employee participation Design interesting jobs Maintain psychological contracts Now let’s explore some of our attitudes at work. You will remember from the last slide that attitudes are our beliefs and feelings about specific ideas, situations or other people. Some examples of attitudes at work include: Job Satisfaction or Morale: This is the extent to which people have positive attitudes toward their jobs. Organizational Commitment: This is an individual’s identification with the organization and its mission. Promoting Satisfaction and Commitment: This includes: Treating employees fairly. Providing rewards and job security. Allowing employee participation. Designing interesting jobs. Maintaining psychological contracts. Teaching Tips: In your student teams, please choose one of the ways of promoting satisfaction and commitment. Please discuss what this element might include and how you might implement this if you were a manager. Answers will vary but can be based on descriptions in the book. © 2009 Pearson Education, Inc. Psychological Contract The overall set of expectations held by employees and the organization regarding what employees will contribute to the organization and what the organization will provide in return Contributions What does each employee expect to contribute to the organization? Inducements What will the organization provide to each employee in return? Matching people with the correct jobs is very important for a healthy and productive work environment. One of the elements we touched on a few moments ago is the Psychological Contract, which is the overall set of expectations held by employees and the organization regarding what employees will contribute to the organization and what the organization will provide in return. In arriving at this psychological contract we also should examine contributions: What does each employee expect to contribute to the organization? In addition we need to examine inducements. What will the organization provide to each employee in return? Teaching Tips: In your student teams, please choose either contributions or inducements. Please discuss and prepare a response to the question for your element. We will share our answers with the class. Answers will vary. 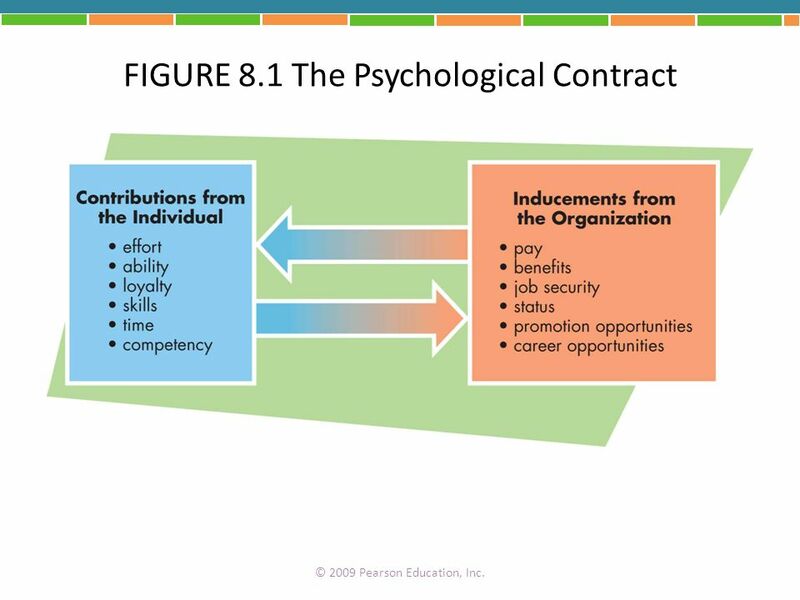 © 2009 Pearson Education, Inc.
Let’s take a look at the psychological contract from a visual perspective. Contributions from the individual can include: Effort. Ability. Loyalty. Skills. Time. Competency. Inducements from the organization can include: Pay. Benefits. Job security. Status. Promotion opportunities. Career opportunities. Teaching Tips: In your student teams, compare the contributions from the individual or the inducements from the organization to your original list. Please discuss and report to the class how many elements you identified and why you believe others not listed should be. Answers will vary. 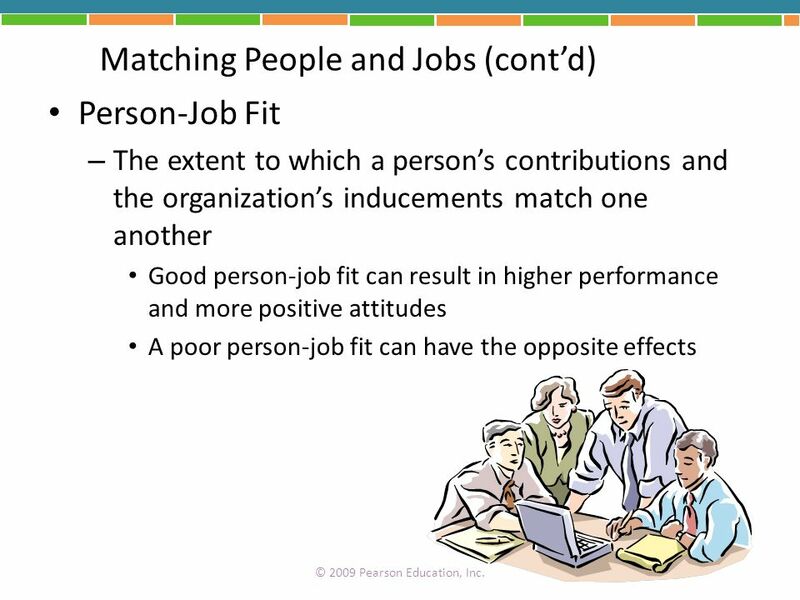 © 2009 Pearson Education, Inc.
Person-Job Fit The extent to which a person’s contributions and the organization’s inducements match one another Good person-job fit can result in higher performance and more positive attitudes A poor person-job fit can have the opposite effects As we move to match people to jobs within an organization, we need to examine the Person-Job fit. This is the extent to which a person’s contributions and the organization’s inducements match one another. A good person-job fit can result in higher performance and more positive attitudes. A poor person-job fit can have the opposite effects. Teaching Tips: In your student teams, please assume you are the human resources manager for your firm. An employee has come to you to say he or she really loves working at the XYZ Company, but after two years with the firm, he or she doesn’t believe he or she is receiving enough compensation based on the extra work he or she has been doing. How would you go about analyzing the person-job fit in this situation? We will share our answers with the class. Answers will vary but could include examining the individual’s work attitudes as well as the psychological contract and its elements. © 2009 Pearson Education, Inc. 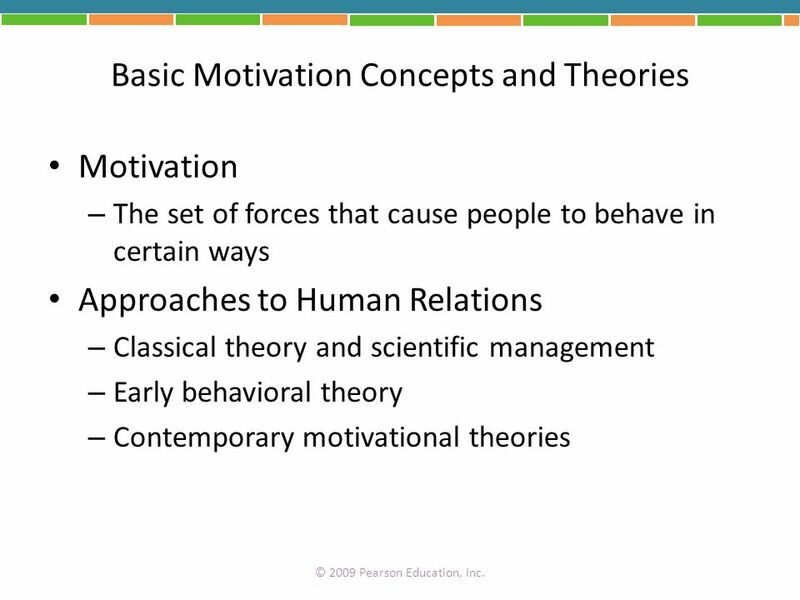 The set of forces that cause people to behave in certain ways Approaches to Human Relations Classical theory and scientific management Early behavioral theory Contemporary motivational theories Let’s examine basic employee motivation concepts and theories. First, let’s define motivation. Motivation is the set of forces that cause people to behave in certain ways. The area of a company that deals with these issues is called Human Relations, or Human Resources. Let’s examine three different approaches to human relations: Classical theory and scientific management. Early behavioral theory. Contemporary motivational theories. Teaching Tips: In your student teams, please discuss the concept of motivation and how you believe you are best motivated to accomplish work. We will share our answers with the class. Answers will vary. © 2009 Pearson Education, Inc.
16 © 2009 Pearson Education, Inc. 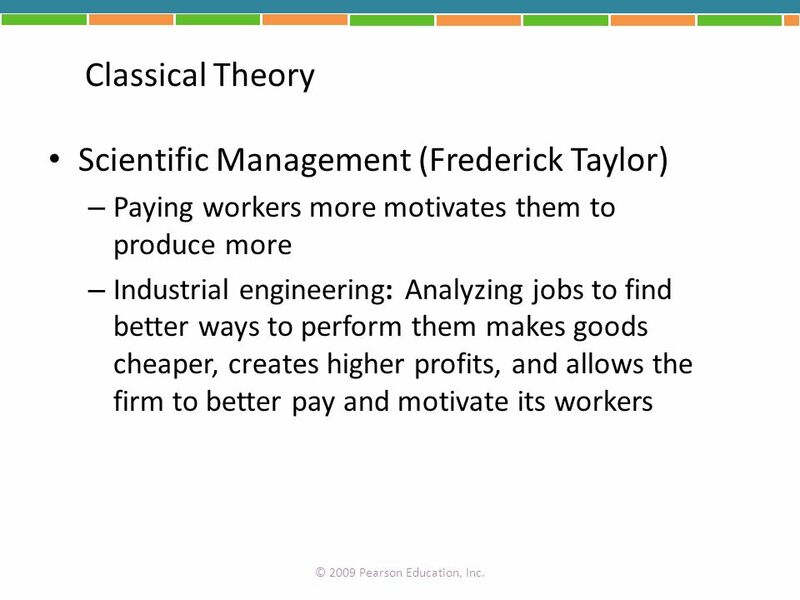 Classical Theory Scientific Management (Frederick Taylor) Paying workers more motivates them to produce more Industrial engineering: Analyzing jobs to find better ways to perform them makes goods cheaper, creates higher profits, and allows the firm to better pay and motivate its workers Let’s look first at the Classical Theory, called Scientific Management, a theory developed by Frederick Taylor. This theory states that paying workers more motivates them to produce more. This theory also focuses on industrial engineering, or the idea that analyzing jobs to find better ways to perform them makes goods cheaper, creates higher profits and allows the firm to better pay and motivate its workers. Teaching Tips: In your student teams, please discuss your opinion on the validity of this classical theory. We will share our answers with the class. Answers will vary. © 2009 Pearson Education, Inc.
Hawthorne Studies Original purpose was to examine the relationship between changes in the physical environment and worker output (productivity). Hawthorne effect: Worker productivity rose in response to any management actions that workers interpreted as special attention. 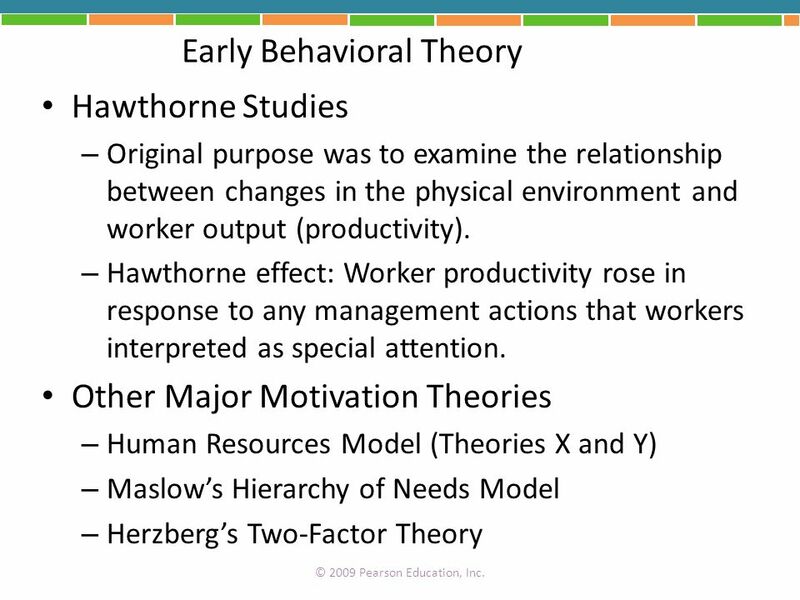 Other Major Motivation Theories Human Resources Model (Theories X and Y) Maslow’s Hierarchy of Needs Model Herzberg’s Two-Factor Theory Next let’s examine early behavioral human relations theory. First we will examine the Hawthorne Studies. The original purpose of the studies was to examine the relationship between changes in the physical environment and work output or productivity. The Hawthorne effect, which was observed in the studies, states: Worker productivity rose in response to any management actions that workers interpreted as special attention. We will also examine other major motivation theories in the next few minutes. These include: Theory X and Theory Y, also called the human resources model Maslow’s Hierarchy of Needs Model Herzberg’s Two-Factor Theory Teaching Tips: In your student teams, discuss your impressions of the Hawthorne Effect. What types of actions by management might be interpreted as special attention? We will share our answers with the class. Answers will vary, but could include things such as painting the workspace bright colors, installing brighter lights, allowing workers to choose music to listen to while they work, etc. 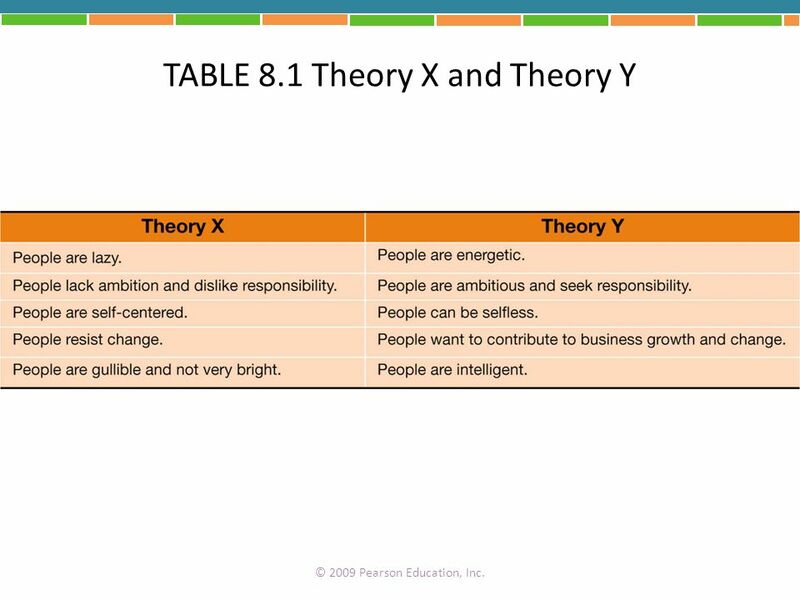 © 2009 Pearson Education, Inc.
Let’s examine the human resources model of Theory X and Theory Y. Developed by Douglas MacGregor, this model states that managers have two very different views of employees and hence ways of managing them. Let’s look at each theory and the managerial beliefs of each: Theory X states that: People are lazy. People lack ambition and dislike responsibility. People are self-centered. People resist change. People are gullible and not very bright. Theory Y states that: People are energetic. People are ambitious and seek responsibility. People can be selfless. People want to contribute to business growth and change. People are intelligent. Teaching Tips: In your student teams, please choose either Theory X or Theory Y. Please describe the management style that would be used under each theory. We will share our answers with the class. Theory X managers, who have a view that people are inherently not interested in work, but do so to earn a salary, would most likely manage through punishment and rules and regulations. Theory Y managers, who believe people are inherently good and motivated, would build on these factors and reward employees rather than punish them. 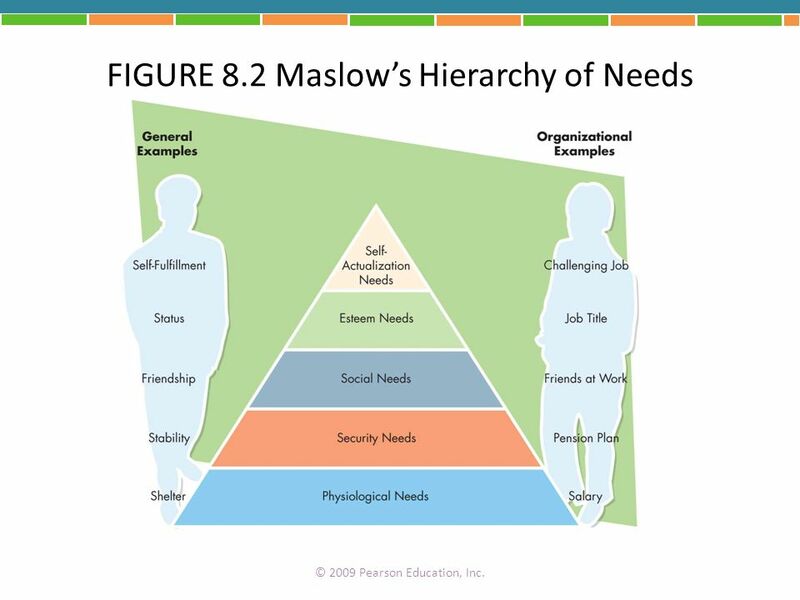 © 2009 Pearson Education, Inc.
Another theory of human relations is Maslow’s Hierarchy of Needs. Authored by Abraham Maslow, this theory states that people cannot move up the pyramid of motivation until they have met the needs of the level below. Let’s look at these levels: The basic needs are psychological needs, like making sure they have food, clothing, and water, which are all very basic. Security needs can only be addressed once one has something to protect, like a house and a family. The social needs mean forming relationships with others. Esteem needs deal with the status a person chooses to have or aspire toward. Finally, self-actualization needs refer to making a difference within a company, a community or society and finding peace with one’s life. This chart provides us with examples of each level from both a personal and organizational perspective. Psychological needs can include shelter from a personal standpoint or a salary from an organizational standpoint. Security needs can include stability on a personal level and the inclusion of pension plans from an organizational viewpoint. Social needs can include friendship on a personal level or friends at work from an organizational viewpoint. Esteem needs could include status on a personal level, like driving the best car, or a higher job title from an organizational viewpoint. Self-actualization needs include self-fulfillment on a personal level or a challenging job on the organizational level. Teaching Tips: In your student teams, please choose one of the need levels. Then please make a list of other examples of that level from both a personal and organizational perspective. We will share our answers with the class. Answers will vary. 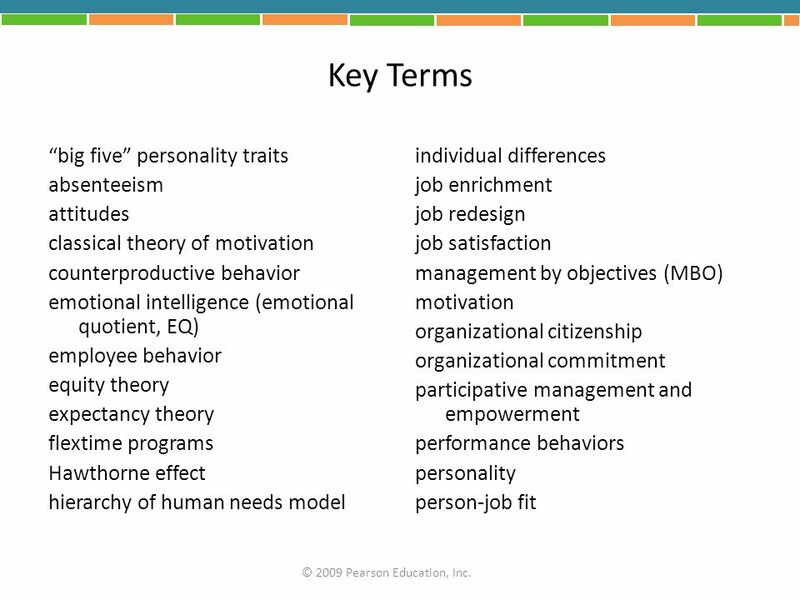 © 2009 Pearson Education, Inc.
Now we will examine the Two-Factor Theory. The Two-Factor Theory was developed by Frederick Herzberg after he studied a group of accountants and engineers. He concluded that job satisfaction or dissatisfaction relies on two factors: The first is Motivation Factors, which include: Achievement. Recognition. The work itself. Responsibility. Advancement and growth. The second are hygiene factors. These include: Supervisors. Working conditions. Interpersonal relations. Pay and security. Company policies and administration. Herzberg found that addressing hygiene factors will move employees attitudes from dissatisfaction to no dissatisfaction, but will not impact satisfaction. On the other hand, addressing motivation factors moves employees from a state of no satisfaction toward satisfaction. Teaching Tips: In your student teams, choose either Hygiene or Motivation Factors, then please examine the types of things managers could do to address either factor. Answers will vary but should reflect on the theory presented above. 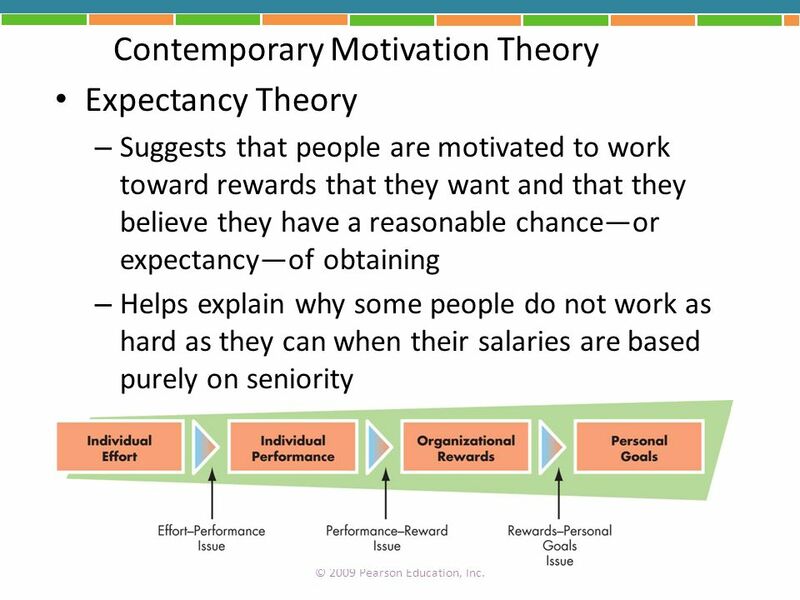 © 2009 Pearson Education, Inc.
Expectancy Theory Suggests that people are motivated to work toward rewards that they want and that they believe they have a reasonable chance—or expectancy—of obtaining Helps explain why some people do not work as hard as they can when their salaries are based purely on seniority Now we will look at more contemporary motivation theories. One of these theories is called Expectancy Theory. Expectancy theory suggests that people are motivated to work toward rewards that they want and that they believe they have a reasonable chance—or expectancy—of obtaining. This theory helps explain why some people do not work as hard as they can when their salaries are based purely on seniority. The model we are looking at shows individual effort leading to individual performance, with effort as the performance issue. Next the model moves from individual performance to organizational rewards, with performance being the key reward issue. Finally the model moves from organizational rewards to personal goals, with rewards as the personal goal issue. Teaching Tips: In your student team, discuss expectancy theory from the perspective of both an employee and a manager. Please record the types of specific things that could cause movement through this model from individual effort to individual performance to organizational rewards to personal goals. We will share our ideas with the class. Answers will vary but should reflect the theory just presented. 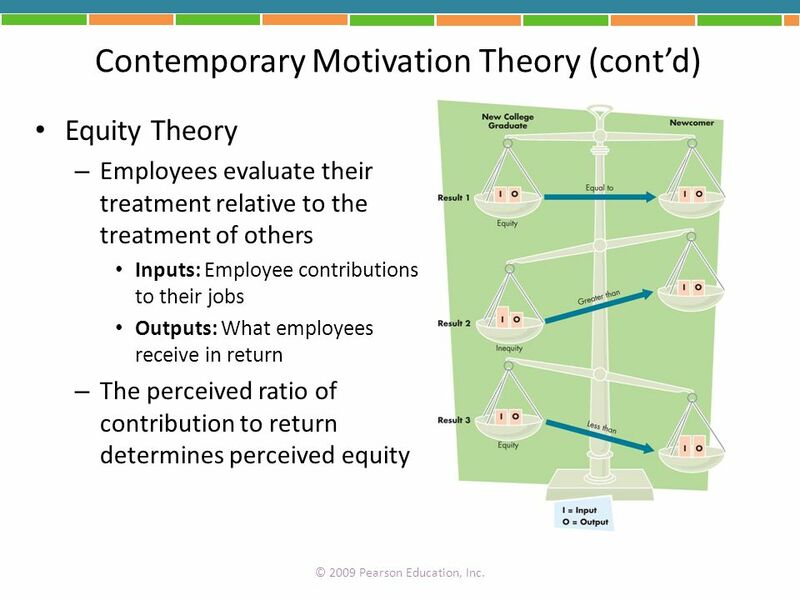 © 2009 Pearson Education, Inc.
Equity Theory Employees evaluate their treatment relative to the treatment of others Inputs: Employee contributions to their jobs Outputs: What employees receive in return The perceived ratio of contribution to return determines perceived equity Another contemporary motivation theory is Equity Theory. Within this model, employees evaluate their treatment relative to the treatment of other. They examine: Inputs or employee contributions to their jobs. Outputs or what employees receive in return. The perceived ration of contribution to return determines perceived equity. Teaching Tips: In your student teams, please develop an example like the one in the diagram. Instead of the “newcomer,” please prepare a diagram based on someone who is hired from the outside of the company who already holds a college degree. We will share our examples. The diagram could be the exact opposite of this diagram, where the outside hire with college and a few years of experience is making more than the college student hire, but with hard work and productivity, the new college grad can pull to a position of equality with the outside hire. Finally, the college grad can surpass the outside hire and be promoted because of youth, ability to grasp new ideas, etc. 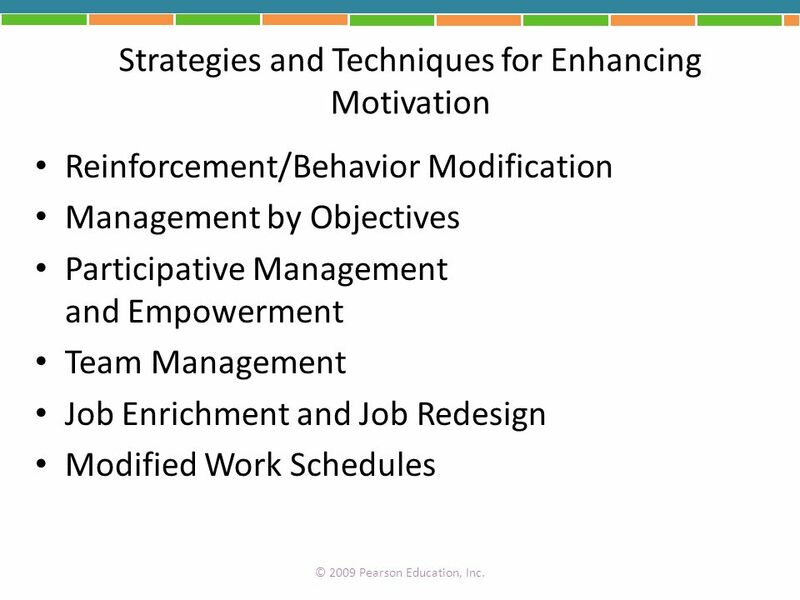 © 2009 Pearson Education, Inc.
Reinforcement/Behavior Modification Management by Objectives Participative Management and Empowerment Team Management Job Enrichment and Job Redesign Modified Work Schedules We will now examine a number of strategies and techniques for enhancing motivation in the workplace. These include: Reinforcement/Behavior Modification. Management by Objectives. Participative Management and Empowerment. Team Management. 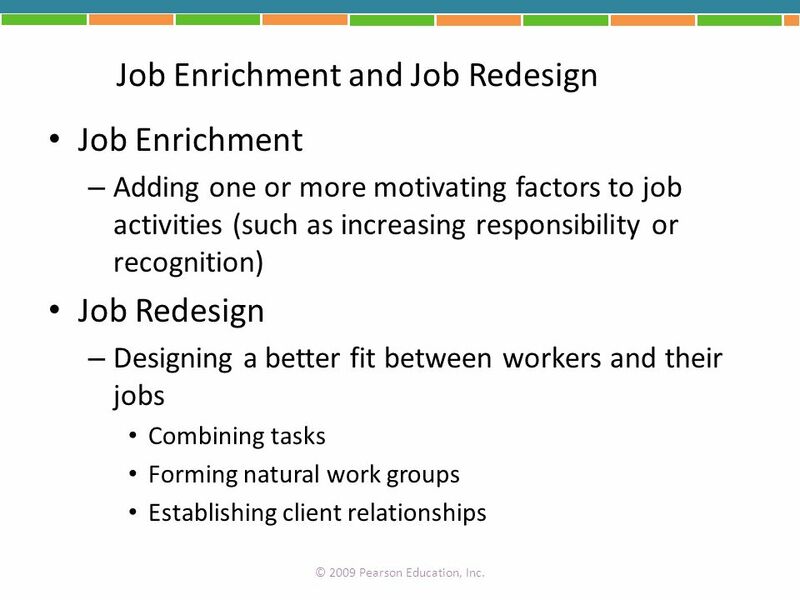 Job Enrichment and Job Redesign. Modified Work Schedule and Locations. Teaching Tips: Please form new student teams. In your new student teams, please choose one of the six strategies and techniques for enhancing motivation. Describe why you chose the strategy and give an example of it. Answers will vary. Save review of the examples for the rest of the slides in this chapter. © 2009 Pearson Education, Inc. 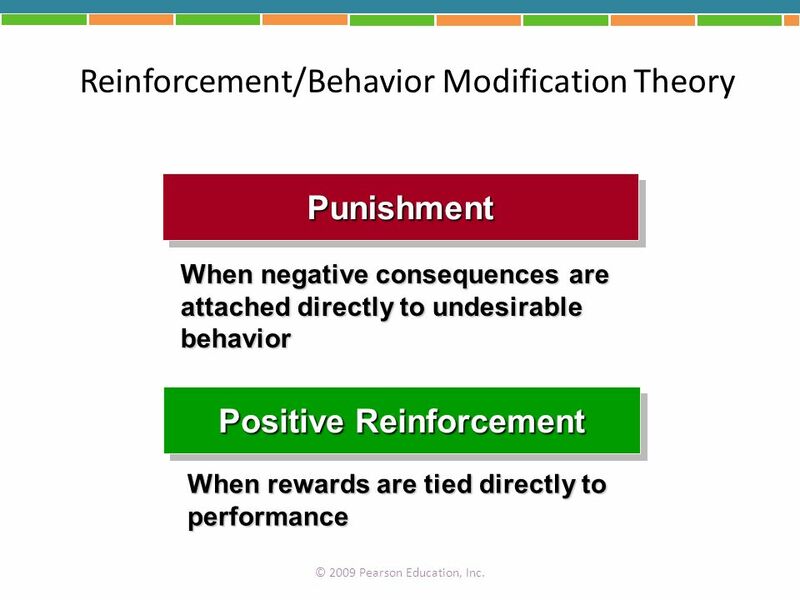 Punishment When negative consequences are attached directly to undesirable behavior Let’s begin by examining the reinforcement/behavior modification theory. This theory holds that punishment and positive reinforcement are the key to motivation. Punishment is used when negative consequences are attached directly to undesirable behavior. Positive reinforcement is used when rewards are tied directly to performance. Teaching Tips: In your new student teams, please choose either punishment or positive reinforcement. Then please prepare some examples of how your chosen behavior modification would affect employee motivation. We will share our answers with the class. Answers will vary but should be based on the theory. Positive Reinforcement When rewards are tied directly to performance © 2009 Pearson Education, Inc.
Collaborative Goal Setting and Planning Communicating Organizational Goals and Plans Periodic Review Evaluation Meeting Setting Verifiable Goals and Clear Plans Now let’s examine management by objectives. 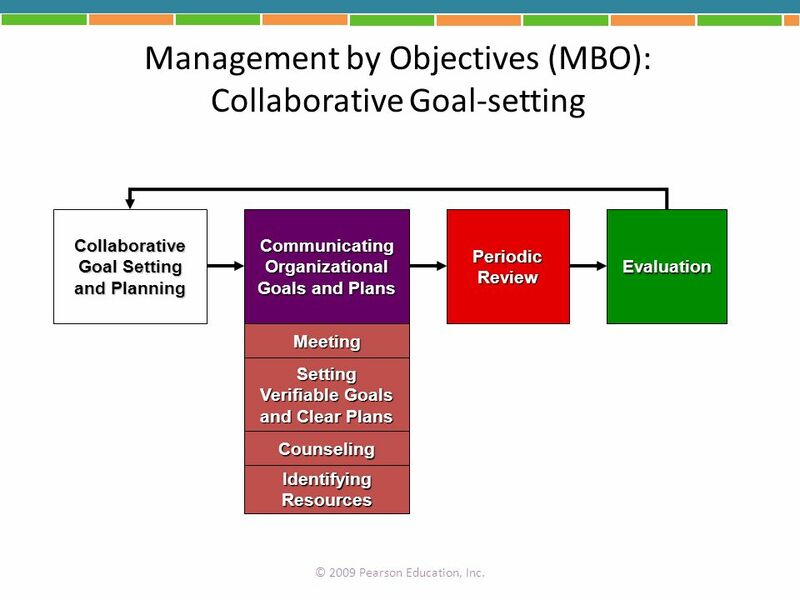 Management by objectives, or MBO, calls for collaborative goal-setting. Let’s examine the process in this chart: First, collaborative goal-setting and planning is done by management with input from employees. Second, the organizational goals and plans are communicated to employees through a meeting. In the meeting, management should work with employees to set verifiable goals and clear plans for implementation. In addition, counseling should be provided to employees so they can stay on track with goals. Resources are identified at this point to assist in meeting the goals and plans. Third, a periodic review is done with employees against the goals that have been set. Finally, the employee is evaluated against the goals and alterations, which allows the employee to provide information for the next set of collaborative goal-setting and planning. Teaching Tips: In your student teams, please choose a small business or store with which you are familiar. Then please prepare sample collaborative goals. One of you will take the role of management and the other will take the role of the employee. Conduct this as a role play. We will share our examples with the class. Answers will vary. Counseling Identifying Resources © 2009 Pearson Education, Inc.
Increasing job satisfaction by encouraging participation Team management represents an increasing trend For example, in smaller, more flexible organizations make decisions more quickly and efficiently Now we will examine participative management, empowerment and team management. 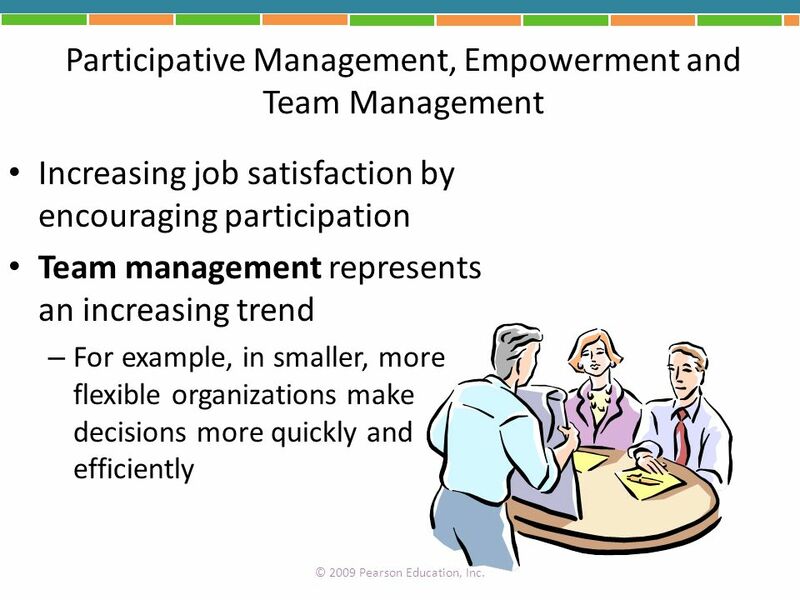 Participative management and empowerment both increase job satisfaction by encouraging participation of employees. Team management is increasing as a trend in managing projects and people. For example, in smaller, more flexible organizations make decisions more quickly and efficiently. Teaching Tips: In your student teams, please write down two examples of either team management or participative management. How would your example empower the employee in your firm? Answers will vary but should address the elements of these three styles of management. © 2009 Pearson Education, Inc. Adding one or more motivating factors to job activities (such as increasing responsibility or recognition) Job Redesign Designing a better fit between workers and their jobs Combining tasks Forming natural work groups Establishing client relationships Job enrichment and job redesign are two important methods of motivation. Let’s examine both. Job enrichment includes adding one or more motivating factors to job activities, such as increasing responsibility or recognition for an employee. Job redesign includes designing a better fit between workers and their jobs. This can include: Combining tasks. Forming natural work groups. Establishing client relationships. Teaching Tips: In your student teams, please develop an example of job redesign or job enrichment. Describe how this redesign or enrichment will increase employee motivation. We will share our answers with the class. Answers will vary but should focus on the key elements of both job enrichment and job redesign discussed above. © 2009 Pearson Education, Inc.
Work-Share Programs (Job Sharing) Pros: Employees appreciate attention to their needs, company can reduce turnover and save on benefits Cons: Job-share employees generally receive fewer benefits and may be the first to be laid off Flex-time Programs/Alternative Workplace Strategies Allow people to choose their work hours by adjusting a standard work schedule Telecommuting Performing a job away from standard office settings Modified work schedules are another way to motivate employees. Let’s look at three examples. Work-share or job-sharing programs. Pros: Employees appreciate attention to their needs and schedules, such as having young children at home and wanting to remain in the workforce but at a reduced level. Pros: The company can reduce turnover and save on benefits. Cons: Job-share employees generally receive fewer benefits and may be the first to be laid off. Flex-time programs and alternative workplace strategies. These program allow people to choose their work hours by adjusting a standard work schedule or to work at alternate locations. Telecommuting allows employees to perform their job away from standard office settings. 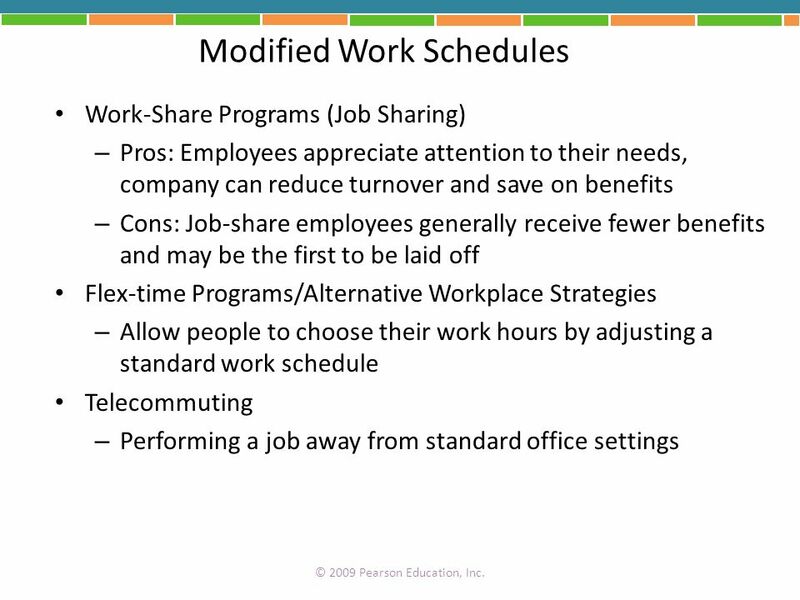 Teaching Tips: In your student teams, choose one of the three modified work schedules we have just discussed. Please prepare two examples of your chosen modified model, and describe the benefit available through the model. We will share our answers with the class. Answers will vary but should address the programs described above. © 2009 Pearson Education, Inc. Disadvantages Challenging to coordinate and manage Poor fit for some workers Lack of network and coworker contact Lack of management belief Advantages More satisfied, committed employees Reduced stress Improved productivity Less congestion Let’s look at some advantages and disadvantages to modified work schedules and alternative workplaces. Advantages include: More satisfied, committed employees. Reduced stress. Improved productivity. Less congestion. Disadvantages include: These types of modifications are challenging to coordinate and manage. They could be a poor fit for some workers. There is a lack of network and coworker contact. There is a lack of management belief. Teaching Tips: In your student teams, please discuss the advantages and disadvantages presented and add two more to each side of this argument. In your team’s opinion, are modified work schedules and alternative workplaces an important way to motivate employees? Why or why not? Answers will vary but should be similar to those stated above. © 2009 Pearson Education, Inc.
classical theory of motivation counterproductive behavior emotional intelligence (emotional quotient, EQ) employee behavior equity theory expectancy theory flextime programs Hawthorne effect hierarchy of human needs model individual differences job enrichment job redesign job satisfaction management by objectives (MBO) motivation organizational citizenship organizational commitment participative management and empowerment performance behaviors personality person-job fit There are many key terms that we learned in this chapter. Teaching Tips: Please form teams of two students. Each team will be assigned a number of terms. Your team should write an appropriate sentence using the key terms assigned to your group, which we will share with the class. © 2009 Pearson Education, Inc.
punishment telecommuting Theory X Theory Y turnover two-factor theory work sharing (or job sharing) There are many key terms that we learned in this chapter. Teaching Tips: Please form teams of two students. Each team will be assigned a number of terms. Your team should write an appropriate sentence using the key terms assigned to your group, which we will share with the class. © 2009 Pearson Education, Inc.
Download ppt "Business Essentials, 7th Edition Ebert/Griffin"
* * Chapter Ten Motivating Employees Copyright © 2010 by The McGraw-Hill Companies, Inc. All rights reserved.McGraw-Hill/Irwin. The Psychological Contract - set of expectations held by an individual with respect to what he or she will contribute to the organization and what the. Motivating Employees CHAPTER 9 The Future of Business The Essentials 4 th Edition Gitman & McDaniel Prepared by Deborah Baker Chapter 9 Copyright ©2009. Chapter Eleven Motivating and Satisfying Employees. Copyright ©2010 Pearson Education, Inc. Publishing as Prentice Hall 6-1 Essentials of Organizational Behavior, 10/e Stephen P. Robbins & Timothy A. Judge. ©2007 Prentice Hall Organizational Behavior: An Introduction to Your Life in Organizations Chapter 5 Motivating Individuals in Their Jobs. Motivating Employees and Creating Self-Managed Teams Chapter 10. Copyright © 2005 by South-Western, a division of Thomson Learning All rights reserved 1 Chapter 14 Work Motivation. * * Chapter Ten Motivating Employees McGraw-Hill/Irwin Copyright © 2012 by The McGraw-Hill Companies, Inc. All rights reserved. Chapter 9 Copyright © 2011 by Nelson Education Ltd. 1 Motivating Employees Prepared by Norm Althouse University of Calgary Prepared by Norm Althouse University. Business Essentials 9e Ebert/Griffin Employee Behavior and Motivation chapter eight.